[This article is a draft. It needs a lot of work]. “That in blessing I will bless thee, and in multiplying I will multiply thy seed as the stars of the heaven, and as the sand which is upon the sea shore; …And in thy seed shall all the nations of the earth be blessed” (Gen 22:16–18). 1. The scattering and gathering of Israel is the ultimate global civilization program. Many channeled works have suggested it was a eugenics program carried out by higher-beings who minister or watch over the evolutionary process of our planet. Its purpose was to civilize the planet in a timely manner and prepare the planet for entrance into the terrestrial glory or Millennial Era (actually just a natural cosmological phenoma of earth coming into a region of space where we are more connected to the galactic aether (Greek)/spirit (Hebrew) or whatever you prefer to call it). Many have also speculated that higher beings used Abraham’s sons along with a few others to introduce certain DNA sequences which have aided mankind in several important aspects of human evolution and eternal progression. Jacob 5 can be used to speculate the scope of this program. 2. The people of “Israel” are NOT the Israel we think of as existing today. -It is important to make clear that “Israel” is NOT the Jews as we know them today. The full 12 tribes of Israel are not recognizable by trying to compare them to the mixed remnants of 2 tribes which compose “Israeli” or Jewish people today. The Bible suggests that Israel was far more multicultural than many suppose. Jacob was purposely inspired to have children with Semitic women (Mesopotamian/Indian) & their non-Semitic slaves (handmaidens) who represented two other major divisions of the earth– Africa! & Central Asia?). Israel has further been purposely mixed throughout the world. The “mother tree” of Jacob 5 is also not a religion, it is a people and culture. The final product will be a global culture & universal brotherhood. 3. “Pruning” is overseen by the higher beings guiding our evolution. It would have occured through population decline, war and plague. Just as with natural selection, the most spiritually and physically healthy live while the undesired and non-robust genetic groups become diminished or extinct. 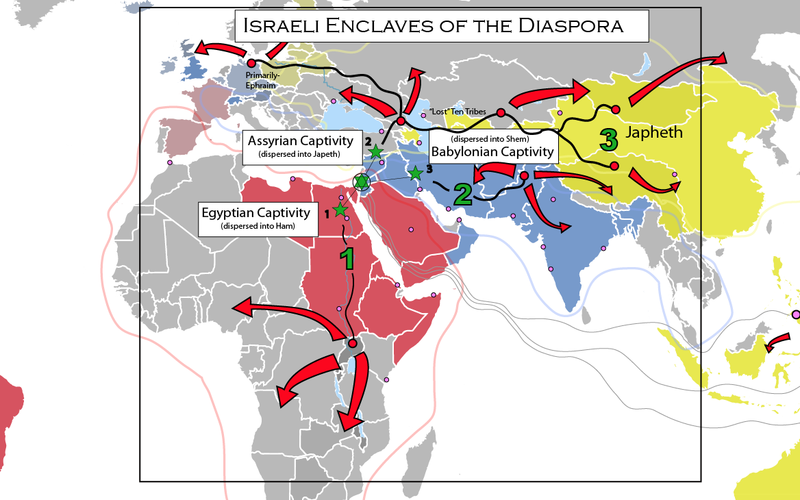 1-Israel mixed into Africa through the Egyptian captivity. Great influence on early Egyptian religion, culture & government. 2-Israel mixed into Greece/Anatolia, North Asia (Mongolia) & Europe through Assyrian captivity. Great influence on Greek philosophy & government, as well as mesopotamia and turkish/mongol law, religion and government. 3-Israel mixed into Near-east & Indian Subcontinent through Babylonian captivity. Great influence of Israeli law, religion and government spanning from Akad/Babylon to Tibet. —FIRST MIXING, PART B. (major period of general diasporic colonialism where Middle-Eastern cultures and Israeli genetic material colonizes the world–including the “island continents”– in the same way European imperialism colonized the world following the renaissance). 1-African Israelis mixed into South America through phoenician trade vessels sometime between 1000BC-500 BC. 2-Ephraimitic Israelis mixed into Mesoamerica by multiple groups just before Babylonian captivity (~600 BC). 3-Asiatic Israelis mixed into Oceania through Tibetan (through Indochina) & early Mongolian groups. Many groups are inspired to island hop throughout the West Pacific. -The first mixing reaches its climax as Israeli culture takes over the Western World through Christianity & Islam. 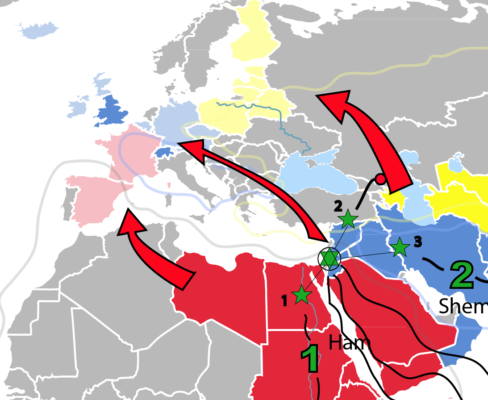 North African, Middle Eastern & Asiatic groups (including Israeli genetic carriers) move into Europe gradually and come to dominate the cultures of civilized western world by the end of the first Millennium AD. –SECOND/REVERSE MIXING, PART A. (major period of colonization and imperialism where Europe spreads its people and culture/religion into all the world, especially the 3 main aisles of the sea, N. America, S. America & Oceania. It is a reverse of the First Mixing, Part B). 1-Iberian (mixed-African) Christians of Spain & Portugal colonize and Christianize South America. 2-Norman (mixed-Semitic) Christians of England and France colonize and Christianize North America. 3-Slovic (mixed Asiatic) Christians of German & Dutch countries colonize and Christianize much of Oceania. –SECOND/REVERSE MIXING, PART B (European Christians colonize and spread their political and cultural ideology into the 3 branches/divisions of Afro-Eurasia). 1-Western European countries colonize almost the entirety of Africa. 2-European culture & ideology is spread by the Russians throughout most of North Asia and the Asian steppe. 3-European culture & ideology is spread by Britain & others throughout India, Indochina and the Middle East. -a final third version of the mother tree is recreated by creating a people and culture/religion who are all inclusive and incorporate the best beliefs/teachings of all the scattered branches into one religious brotherhood of man (the United States began this–spreading its influence across the Christian world, but restored Israel in Judea will finish it–spreading its influence across the Islamic world). -this mixing parallels both the former mixings. With each superpower (America & Restored Judah) becoming a mixing pot of all the cultures on earth (but especially Christian culture for America & Islamic culture for Restored Judah). this is spread to the scattered branches and then the scattered branches are gathered back into it as well, and both pruned and cared for until they all resemble one healthy tree bearing fruit. Its hard to judge which aspects of the story of Noah are literal and which are metaphorical. I also believe the biblical Patriarchal Period (from Noah to Abraham is symbolic of a larger span of history, each patriarch representing an early epoch. Oahspe gives some interesting ideas on this.) 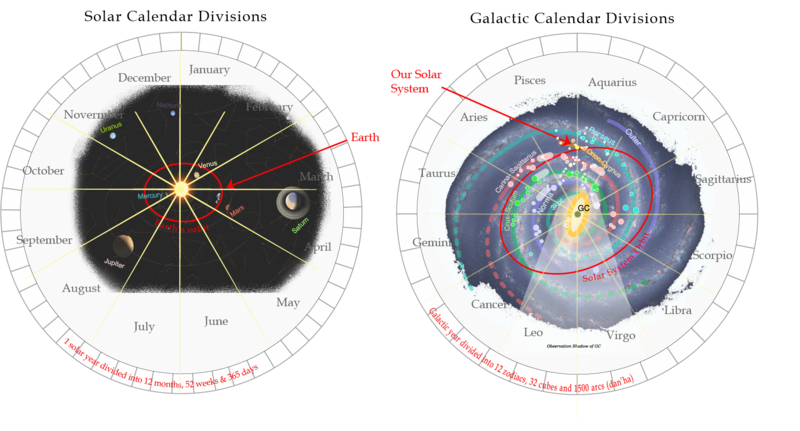 First we look at the 3 divisions of the earth given to Noah’s 3 sons after the flood (explained best in the book of Jubilee). They may be actual individuals or more likely be metaphorical archetypes of groups of people. The oldest, Japheth is given the north-lands (East Asia/china), the youngest, Ham is given the southlands (Africa), and Shem the birthright middle-child is given middle-earth (Mesopotamia to India). lands given to Ham, Shem and Japheth as explained in Oahspe and other texts. Abraham was a living archetype born in the lands of Shem. Joseph leads his posterity into Ham where they become captive for somewhere between 230 – 400+ years (and are scattered throughout Africa), before they are liberated back to their central homeland . I speculate they integrate heavily with Shem in India during this time (Period of the Judges to just after king David). The second major captivity brings them into Japheth’s captivity with the Assyrian invasion and captivity of the Northern 10 Tribes of Israel . 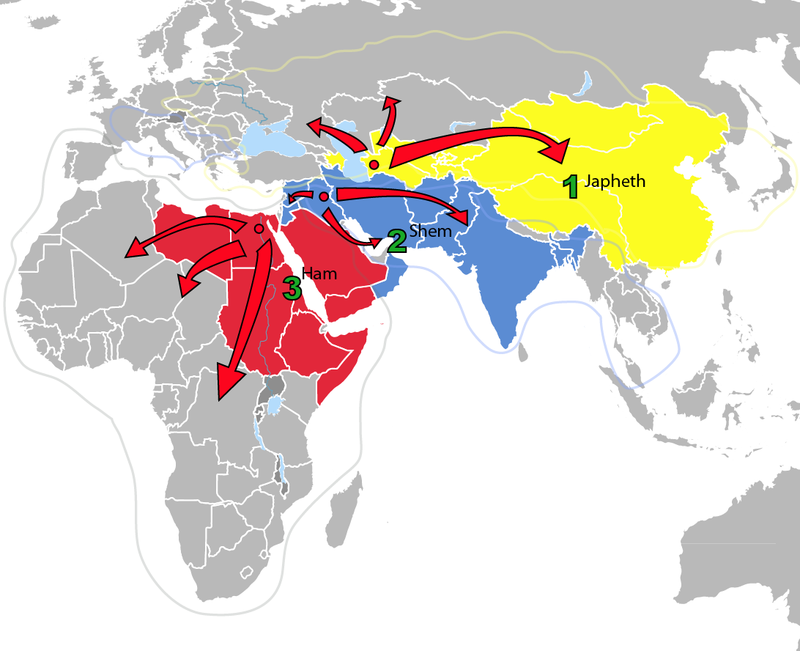 Josephus, the Book of Jubilee and other obscure sources suggest at least one group of the Northern Kingdom flee deeply into north and east Asia assimilating with the Scythians or proto-mongols & European nomads (Scandinavia, Mongolia & China). Others likely integrated with the early nomadic turkish peoples and Arian’s of the caucasus region. 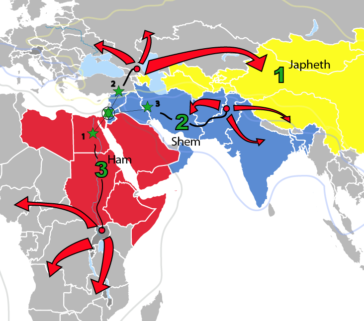 The Babylonian invasion brings large populations of the Southern Kingdom of Judah into captivity in Shinar where they spread throughout the lands of Shem  from Mesopotamia to India & Tibet… especially during the Persian and Macedonian periods. (Babylon is primarily Semitic even though Nimrod its founder was of Ham through Cush). Israel is scattered into Ham, Shem and Japheth during the Egyptian, Assyrian and Babylonian captivities. During the era from about 500 BC to the time of Christ, the empires of the Middle east experience a period of expansionism and colonialism similiar to that of European Colonialism 2000 years later. There is evidence of Phoenician trade, shipping, colonialism and settlement from Northern Europe to Southern Africa to Indonesia. The Jews are also prolific during this era in setting up colonies in much of the known world. The Book of Mormon tells of the colonization of North America by at least two Israeli group, and Jacob 5 alludes to two other large colonizations to two other major “isles of the sea”, which I speculate are South America and Oceania. (The key to inferring this is in the verse that says the reverse grafting happens in last days… so just look at where europe colonized and you will see these are the obvious places.) Even discounting the Book of Mormon narrative, there is evidence of extensive colonization throughout much of the Old world, and quite possibly even in the new world. The Kolbrin also recounts in detail the early colonization of Britain during this era by Israeli Egyptians and Phoenicians. The three transplanted branches of the mother tree (groups from mother israel) are taken to North America, South America and Oceania. During the Israeli diaspora period of 600 BC to 450 BC. Europe is kept largely unsettled by its climate in early history, but with climate change Europe opens up for heavy colonization about 600 BC. Ham, Shem & Japheth move into their respective areas. The Kolbrin talks about huge Egyptian & Phoenician migrations. After Christ, Israel is salted into Europe and Jewish merchants and mystics become likely the single largest ruling influence upon the continent. By this time genetic code has been mixed thoroughly enough as to make differentiation between “Jew and Gentile” difficult. Even so cultural Jews seem to thrive. After Rome’s destruction of Judah in 70 AD, the final diaspora leads hundreds of thousands of Jews into Europe, which is just beginning to grow rapidly in population and prominence. –European Colonization & The Great Mixing (1500 AD – 2000 AD). Grafting ‘them into them’: the colonial era and European imperialism is the key to knowing where the three branches of Jacob 5 were transplanted (given the B.O.M. narrative). Just look where Spain and England settled and civilized. England, largely colonized every division on the world (Ham, Shem and Japheth in Africa, India and China respectively). It also civilized “the isles of the sea” or the Americas & Oceania (Australia, New Zealand, etc..). The Iberians (Spain & Portugal), did most of the rest with South America & Oceania (Philippines, more, more, etc). Europe’s colonization and conquest of the world. need to add boat routes and colonies. The restoration began in the 19th century with the Zionist movement. The gathering will take place in two locations, Israel and North America. Both have already begun. The European Jews are the first fruits, but the Book of Ben Kathryn chronicles the wholesale resettlement of the entire Middle Eastern region as the climate shifts to more hospitable conditions. America has also become a melting pot, but the major gathering will take place after the United States divides and then begins to be rebuilt with true states rights. The key to fully seeing the totality and fulfillment of this promise unto the House of Israel, is a simple line found in the prophesy of the ancient prophet Zenos. And an understanding the global colonialism by Gentile Christianity beginning with Christopher Columbus until present, is a preparatory fulfillment to the grafting in of the natural branches spoken of by Zenos. Zenos’ Allegory of the Olive Tree is perhaps one of the most profound treatises offered on the topic of the scattering and Gathering of Israel found in Holy Writ. It is so impressive, in fact, that hundreds of years after it was given, Paul seems to drawn from its imagery by memory as he states to the Romans “And if some of the branches be broken off, and thou, being a wild olive tree, wert grafted in among them, and with them partakest of the root and fatness of the olive tree” (Romans 11:17). One reading Paul’s treatise on the scattering and gathering of Israel might not catch the full significance of the comparisons made had they not access to the original text from which he quotes. (available here). All the major players in the Human Drama have had the choice whether to unite or divide humanity. I believe in this final age, God will favor and sustain only those who unite. All other groups will become extinct. See the article The Scattering and Gathering of Israel for details on gods evolutionary plan for populating, diversifying, civilizing and unifying the planet. -The birthright is almost always given to the middle-child in the middle-land. The middle son, like Christ is the divine center. They are the strait and narrow way (or narrow middle way). The type is continued again and again, the first looses favor because of pride. From Cain, to Japheth, to Ishmeal, to Isau, to Rueben, to Saul, to Lamen, etc… The middle son becomes a microcosm of the opposites. He is the at-one-ment, and type of harmonizing the older and younger. He becomes a type of the first and the last, and is charged with redemption and bringing them together in harmony. This is also the job of scattered Israel. 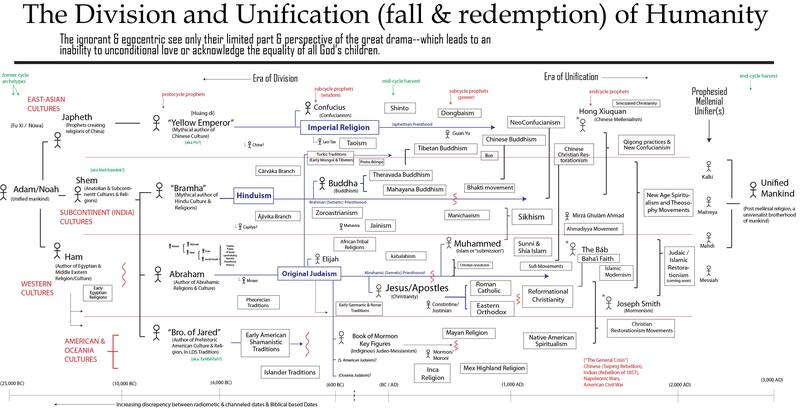 -In both the times of Israel (Abraham to Christ) and during the Times of the Gentiles (Christ to present), God scattered the body of Israel (the chosen seed of Shem) into the lands of Japheth, Shem and Ham, as well as scattering/leading splinter groups of Israel into new frontier lands separated from the main body of humanity/civilization. 1-The Egyptian habitation/captivity. During this 200+ year era, all 12 tribes are scattered throughout Hams seed by trade, migration in intermarriage. 2-The Assyrian deportation. Around 750 BC, Assyria sacks the Northern Kingdom of Israel and deports a large portion of its population into the Northern reaches of Assyria. Alter this flash application to show the colonization of all European colonies around the world. Perhaps turn it into a leaflet map. and show how the colonies in Europe mirror the colonies of Israel and the 3 branches of the olive tree in the allegory.